Assemble all the root vegetables, shallots and garlic in a large baking sheet. Drizzle 2-3 tablespoons of the olive oil, along with a generous sprinkling of the salt, pepper and rosemary. Roast for 1 hour. During the last 15 minutes, add in the apples (at this point you can remove any pieces that are likely already roasted, such as the shallots and garlic). In a medium soup pot (about 2 ½ quart size), heat the remaining 1-2 tablespoons of olive oil. Squeeze the roasted garlic cloves out of their skins and add to the oil and sauté for a minute. Then add in all the vegetables, along with the grated ginger, cinnamon and broth. Bring to a simmer and let simmer for 10 minutes. 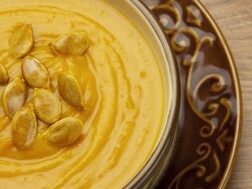 Using an immersion blender, puree the soup until a velvety, smooth consistency is reached. OR, ladle the soup into a stand blender and blend in batches until it is all pureed. Taste and adjust seasoning if needed. Sounds yummy! When can I come and try some?